I’ve been a little absent lately from blogging. My class schedule is just been really tough for me plus the fact that my oldest was involved in a ton of senior activities. I just can’t believe I have son that has graduated high school. Where did all the time go? Seriously, am I really old enough to have son out of high school and on his way to college? Three weeks ago we went to visit Point University in West Point, Georgia. It’s about three hours south of us on the Georgia/Alabama border. Point University is a smallish private Christian university. The campus is way, way small but packs a bunch. It is located in historic downtown. They are buying and fixing up buildings to use for the school but instead of total tear downs they are using reclaimed wood from the buildings and the old wood mill in town. Keeping history alive so to speak. We were very impressed with their set-up and opportunities for students. The main campus is in West Point but they have satellite campuses in different places in Georgia. They have practically all the sports such as football, soccer, basketball, baseball, softball,track,etc which is good. This year the music department is starting up a marching band which is how we heard about this school. Fall 2015 will be their first season. The band director is really awesome and made trips all over the state to schools with marching bands introducing the school and talking about the program. One of the advantages of this being the start of the marching program is there are no try-outs and every kid participating in marching band gets a scholarship. Right now we are still waiting for his high school to send his transcripts but we are almost finished applying. Yay because camp starts the end of July. We didn’t take too many pictures because we were busy soaking it all in but here are a few. They put his name on a guest parking space so only we could park there. We thought it was really cool. This water feature is one of the first things you see when you enter the building. The band director took us out to lunch during our visit. We were going to a pizza place but they were so packed there was a line out the door. 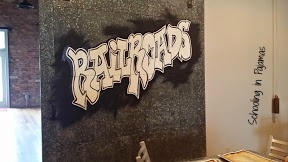 Instead we went to a place called RailRoads. It is a hotdog joint with different hotdog offerings as well as offering a philly sub, a hamburger, and several other things. The food is good, the decor cool, the people are nice, and the place is clean. Plus it is only 2 blocks from the school. The seniors at my son’s high school get out a week earlier than everyone else but they are not totally done yet. 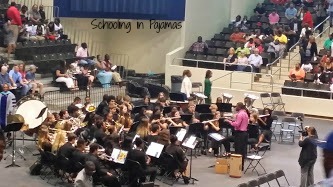 We had senior picnics, a final band concert, a band banquet, and several graduation practices. Then the day was finally here. On May 23 my oldest child graduated from high school and made the end of his journey official. But his next journey is just beginning. I won’t bore you with the many, many, many pictures I took however I want to share a few with you. It was sad watching the band play knowing that he would no longer play with them. Usually he is participating at each performance they have. This brought it home even more for me. All the senior class waiting for their names to be called. 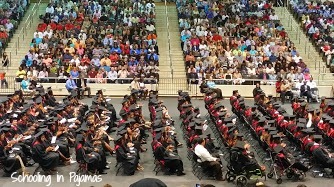 It was such a large class with 40 honor graduates. There was so many people that places to take photos was at a premium. Unfortunately for us, we could only snag a spot under the trees. Afterwards, we drove 45 minutes to eat at Olive Garden which he is where he picked to eat. We had a great time together. None of the kids fought with each other and the food was great. Now on to the beginning of another great adventure- COLLEGE!